The THB Tropical Island is one of the best resorts in Playa Blanca, Lanzarote. It guarantees unforgettable Lanzarote holidays filled with activities and fun. It features 14 swimming pools, sports facilities, spa and fitness centre, Jacuzzi, trendy bars, clubs, theme restaurants and a range of leisure and entertainment options. With its own water slides and kid’s clubs, Hotel THB Tropical Island in Playa Blanca is a haven for families. Its water park, kids’ pools, game arcade, water sports and bundles of fun activities are certain to keep everyone busy from sunrise to sunset. The Playa Dorada beach and Papagayo beaches, which are known to be one of the best beaches of Lanzarote are located nearby to add a 7-aside football pitch, so groups of friends also flock to the hotel's capacious apartments to enjoy the on-site amenities. 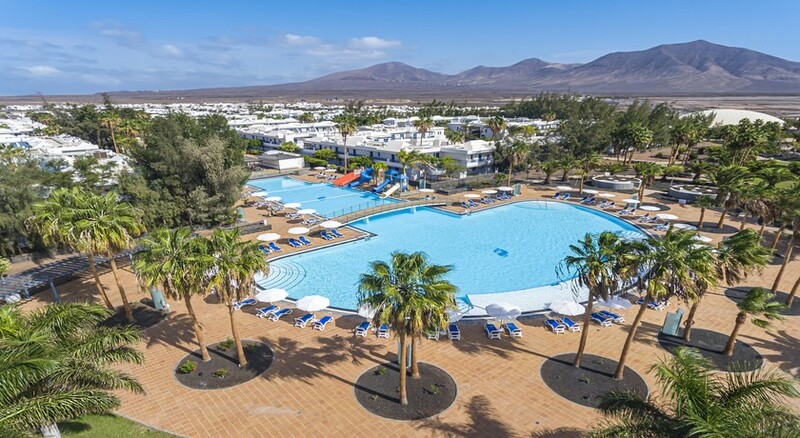 The seaside retreat of Playa Blanca in Lanzarote is popular among holidaymakers looking for endless fun, and that’s what THB Tropical Island is all about! Located in beautiful Playa Blanca, in the south of Lanzarote, THB Tropical Island Lanzarote covers an area of 102,000 sq. metres. The Dorada beach is only 1.6km away (free bus service is provided), where you can also find seafront restaurants, clubs and bars. It takes about 20 minutes to reach the famous Timanfaya National Park from the hotel. Many shops and cafes in Playa Blanca are around 2km away. Many flights to Lanzarote from all across the world land at the Lanzarote Airport, which is 27km from the hotel. The THB Tropical Island Playa Blanca houses 414 apartments spread in numerous individual blocks. Categorised into Premium Apartment and Connecting Premium Apartment. These apartments can accommodate up to eight people – a good choice for large groups. The spacious and modern apartments offer a living room, kitchen, bathroom, separate bedrooms and a balcony. All are furnished with air conditioning, telephone, TV with satellite, safe deposit, hairdryer, sofa bed, couch, twin beds and Wi-Fi connectivity. The well-appointed kitchen is equipped with microwave, juicer, electric kettle, fridge and more. There are wide-ranging dining and drinking options in and around the resort. 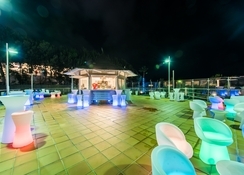 The resort offers a superb all-inclusive package enabling guests to enjoy a delicious meal or drink. 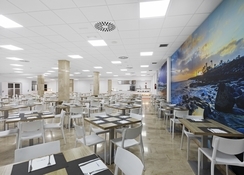 The hotel’s four restaurants and bars serve a variety of cuisines – Desayuno, Almuerzo, Cena, Restaurante Tematico a la carta, Bar Piscina, Bar Piscina, Bar La Teberna and Bar Carpa the Dome. 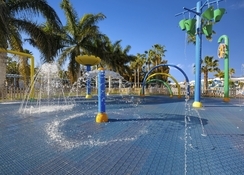 The THB Tropical Island Playa Blanca features two giant swimming pools and eight circular pools for adults, and four pools for children, along with a water park (Splash Park). The hotel features a mini club for kids, where a variety of activities can be enjoyed including painting, dancing and playing games. Those who want to stay active on their holiday can hit the fully-fledged fitness centre with expert trainers. At the hotel, you’ll find multiple sports courts, including an artificial grass seven-aside football field, two tennis courts and a natural-sand volleyball court plus a fitness centre that offers gym facilities, aerobics and fitness programmes. There is a myriad of sports activities to indulge in like table tennis, tennis, billiards and darts while the beaches feature many water sports activities. What makes this hotel one of the best hotels of Lanzorate is the luxurious spa offering Thalassotherapy, Turkish bath, toning pool, massage, sauna and Jacuzzi. There are also multiple entertainment events for all age groups throughout the day. I’ll start with the few not so good parts, arriving to the hotel on the transfer your used to being on a while but we all realised on the coach that the first stop that got dropped of our hotel was literally over the road but we seemed to stay on the coach an extra 40-50 mins before our drop of we didn’t realised this going, with it being dark. The entertainment isn’t really there for the adults we were lucky we made quite a few friends while we were there so made our own enetertainment, one other thing which you can’t do anything about but getting early flights is arrivin late they gave you a little lunchbox which wasn’t great but thoughtful and to be really honest apart from that it was totally spot on the rooms are all white so are nice and clean, ours was two single beds pushed together but seems nowerdays that’s what most hotels do which is annoying, our apartment was bottom floor right near the front of house which was nice and easy if you needed anything, if your guna go you pay 10 Euro at front of house to borrow there fob for the back gate which knocks of 20-30 minute walk to the beach which is handy! The place is lovely it’s not like typical Spain the beaches are gourgeus the people are nice I would generally recommend this hotel we joke about going back all the time it’s super easy great for kids or couples! I would defo go back again! Very central to the shops and beach. Very clean and friendly staff. All of your needs met. I really enjoyed staying here. We stayed quite near the reception. The food was amazing and we loved the variation. I wouldn’t suggest booking for the bespoke restaurants as the food wasn’t as nice as the normal restaurant and there was little choice. The rooms were clean and tidy. We did have to ask for a few more towels and pillows but that was brought quickly. We were delayed due to the beast from the east so arrived 2 days late. The hotel made us wait until 2pm to book in even though we had already paid for an extra 2 days. When complaining they stated that they had done us a favour by keeping the room back for us. I don’t agree that this is a favour. We had paid for the room so technically it should be clean and ready for us to book in as soon as we arrived. However they have given us compensation for this. The entertainment was good. It was quite late for the kids and my son was quite tired. The daytime entertainment we didn’t use because there wasn’t many other children around. The pool was quite chilly (Early March) so we would have used it more if it had been heated. From start to finish this holiday went like clockwork, from the easy booking to the hotel transfers to and from a fantastic hotel. This is the duel in the crown of Lanzarote . Big thanks to Teletext Holidays and the THB Tropical Island. I know who Im booking with next time. Everything about this hotel is perfect for families with children of all ages. The main pool is great for older children with the slides and activities and there are smaller pools which are perfect for younger children and babies. The hotel is a short walk from the beach and marina, I would recommend getting a key fob from reception to access the rear gate. The key fob is 10 euros which is returned at the end of your stay. Lovely friendly staff in all areas of the hotel. fantastic hotel ....loads of your own space ....adult pool was lovely but so were all the rest ...we stayed self catering so cannot comment on the food and drink ,but on observation looked nice.rooms were special and cleaned everyday .make sure you get a gate key though because it saves you loads of time and a deposit of 10 euros which you get back . One of the best holidays I've had! THB tropical is a great hotel with really friendly staff. We went in September so the hotel was pretty quiet as out of season but still felt like they put in a lot of effort. The food was great, although our favourite meal had to be breakfast (full English followed by churros!!!) Although not everything was to everyone's taste each night there was always something tasty so no complaints here. Plenty of pools which were all kept exceptionally clean and the room was lovely too. I can't say anything bad about our stay here and we would love to come back again soon!